A friend of mine chartering a French boat in the Med recently, hoisted an Australian flag to tell others the nationality of the crew. Unfortunately, he hoisted it in the wrong place and found himself raided by the local constabulary. Etiquette is the word we use for conventions in our society designed so that we do not cause offence. 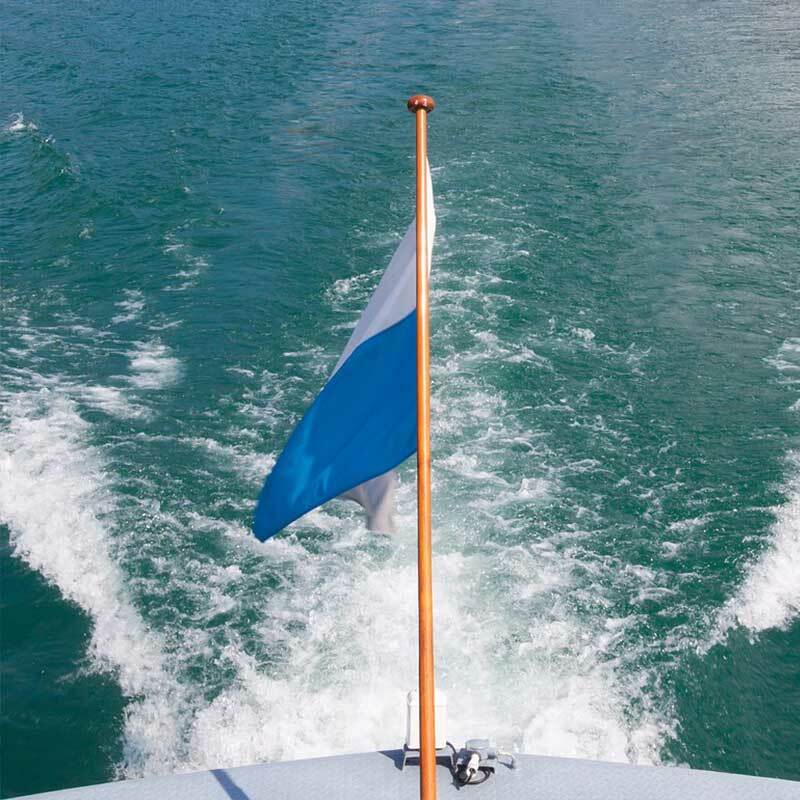 Boating is a society with its own laws and convention so here is a guide to flag etiquette. All Flags fall into a number of categories. Most important of which is the national flag. Every Australian owned vessel is entitled to fly our national Flag which is the blue ensign. The next most important is a club flag or house flag of the owner. Ships often have these to indicate which line a ship might belong to. Then comes flags for making signals. This might be a code flag Q if you were entering a foreign port and wanted customs clearance or a cocktail flag to tell others in an anchorage that you were inviting others over for a drink. Having established that some flags outrank others there is also seniority for the position on a boat that flags are flown. In general, the stern outranks the bow. Higher out ranks lower. Starboard out ranks Port. Thus most boats fly the national flag (the flag with the highest seniority) from the peak of a gaff boom at the stern if it has one (position 1 in the picture) or a staff at the stern (position 2 lower at the stern). If neither of these is available the national flag will be flown from the mast peak (position 3 in the picture). 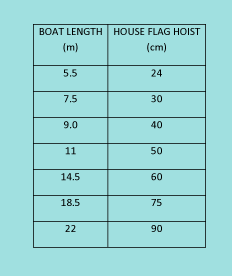 The house flag or club burgee would normally be flown at the masthead (position 3 in the picture) but if that were not possible then at the bow (position 4 in the picture) and if that were not possible then in the starboard rigging (position 5 in the picture). Signals would normally be made in the starboard rigging (position 5 in the picture) but if they were occupied then the port rigging (position 6 in the picture). If only one flag halyard were available then the flags would be stacked so that the most senior national flag is on top and other less senior flags in descending order are underneath. When yacht racing all the flags mentioned so far should be lowered, firstly to allow race management the opportunity to use these spaces for their own use, but more importantly to tell other boat users that you are racing and those good manners would allow you to pass through rather than exercising other rights of way that might apply. Having the right size of ensign makes your boat look great and is a credit to the owner. How big should these flags be? 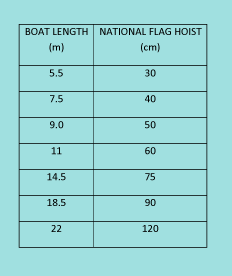 A good rule of thumb is for the hoist (height) dimension of national flags at the stern to be as above. National flags, club and house flags flown elsewhere as above. 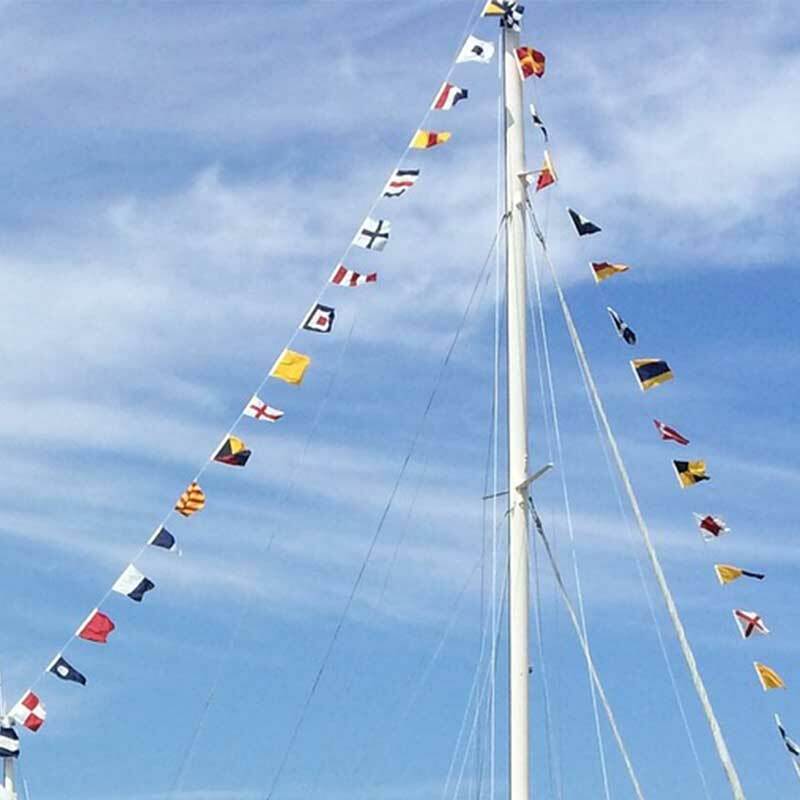 “Dressing Overall” is a procedure for festive occasions when all the signal flags are strung from the bow to the masthead, between masts if there is more than one, and then down to the stern. This is only done alongside the wharf or at anchor. There is a challenge to mix the flags up in a colourful rather than a meaningful way and as such, it is pretty bad form to include national flags in the string.